We are happy to announce that our vendors have enough produce to continue holding markets for 3 weeks in November! We will be only in the center of the Plaza meaning we will not be closing any roads so there will be a lot of parking. 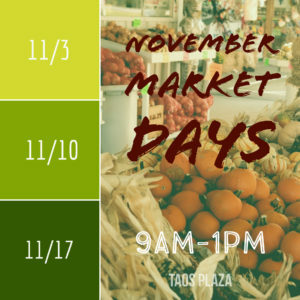 We will open at 9am and close at 1pm for these 3 November markets only. Get all your local food for your Thanksgiving meal this year in Taos! Previous PostPrevious 10/27/18: Halloween Costume Contest! Next PostNext 2019 Vendor Applications NOW AVAILABLE!